A Thermal Bank is a bank of earth used to store solar heat energy collected in the summer for use in winter to heat buildings. A Thermal Bank is an integral part of an Interseasonal Heat Transfer system invented, developed and patented by ICAX to answer the need for on site renewable energy without burning fossil fuels. A Thermal Bank is used to store warm temperatures over a very large volume of earth for a period of months, as distinct from a standard heat store which can hold a high temperature for a short time in an insulated tank. It is a characteristic of earth that heat only moves very slowly through it – as slowly as one metre a month. ICAX exploits this thermal inertia to input surplus heat into the ground over the summer months and extract that heat over the winter months for use in the space heating of buildings. Interseasonal Heat Transfer works by capturing heat energy from the sun via a collection pipe network just beneath the surface of black tarmac roads (or car parks or school playgrounds). It then stores the energy in computer-controlled Thermal Banks in the ground under the foundation of buildings, and releases it to heat the buildings in winter via heat pumps linked to underfloor heating. The temperature of the ground at a depth of seven metres in the UK will normally be very close to 10°C – the temperature will vary very little between summer and winter as heat only moves very slowly in the ground. 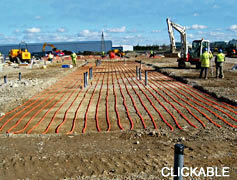 ICAX uses this characteristic of the ground to store heat from summer to winter. 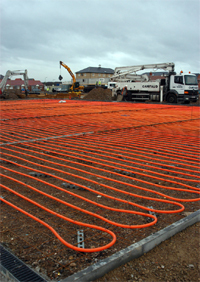 Using fluid – in an array of pipes – as the transport mechanism solves the difficulty of getting the heat into the ground – and out again. The way in which heat is absorbed and released by the ground is complex and required to be studied using complex iterative methods that have only become practical with the use of computational fluid dynamics (“CFD”). The computer models developed by ICAX have since been tested in practical installations and refined to reflect empirical results. These have been used to refine the design parameters for successful ThermalBanks. 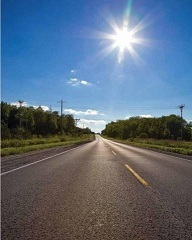 Tarmac roads tend to absorb the heat of the sun up to the point when they radiate heat as quickly as they are absorbing it: the surface temperature of tarmac can often reach 15°C higher than the ambient air temperature. ICAX collects heat using water circulating through an array of pipes embedded in the surface of the tarmac and deposits it in ThermalBanks constructed beneath the insulated foundation of buildings. The temperature across the ThermalBank can be increased from its natural temperature of 10°C to over 25°C in the course of the summer months. ICAX uses a ground source heat pump to extract heat from the ThermalBank when it is needed to heat the building in winter using underfloor heating. Unlike a normal ground source heat pump which typically starts with an autumn ground temperature of 10°C the heat pump in an Interseasonal Heat Transfer system starts with a temperature of over 25°C from the ThermalBank. This doubles the Coefficient of Performance of the heat pump and allows a 50% saving of carbon emissions compared to providing heat from a gas boiler. A Thermalbank is also described as Underground Thermal Energy Storage – UTES, or as providing Seasonal Heat Storage. A ThermalBank allows you to reuse heat. Where it is not practical to create a horizontal Thermalbank to store energy ICAX uses a borehole field to perform the same function. This is described as Borehole Thermal Energy Storage – BTES. See also: Renewable Heat Incentive clean energy cashback for most of your running costs for over 20 years. “A useful technology will surely be long-term thermal storage.” according to Professor David MacKay. Others have described Thermal Energy Storage as "the holy grail of the renewables industry". A Thermal Bank is a bank of earth used to store heat between seasons. Alternative descriptions include: Heat Bank, Heat Battery, Heat Store, Heat Vault, Underground Energy Storage, Seasonal Heat Storage, Interseasonal Heat Store, Seasonal Thermal Store, Interseasonal Thermal store, Underground Thermal Energy Storage ("UTES"), seasonal soil heat accumulator.